We will gather materials in the wood for kindling and identify good sources of plants and trees. Then learn how to use a flint and steel to light our own fires. 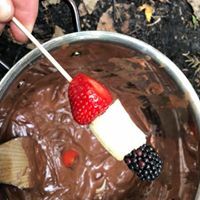 Once established a good fire we will make a hot drink using the kelly kettle and make a chocolate fondue – please bring something to dip into the fondue for example pieces of banana, strawberries, marshmallow. Bring snacks to nibble on as you may get hungry in the woods and a cup for your hot drink! Age: 6+ years – accompanying adults are free and asked to join in! Come dressed for the British weather!